This bike is a racehorse for ladies who eat carbon for breakfast, regularly rock spandex and love going fast–uphill and down. While perhaps not the most versatile bike of the bunch, it is very good at what it does: Devour trail at an impressive rate. The Spark dissected technical problems with surgical precision, climbed like a rocket and felt aggressive yet stable on spicy descents. It's not forgiving, but it responded well to being manhandled (er woman-handled?) and seemed eager to thrash any opponent. With 27.5-inch wheels and 120 millimeters of front and rear travel, the Spark technically fits into the trail category. However it rode more like an XC rig due to its super-stiff carbon frame and fixed seatpost. If you come from an XC background this seems like pretty standard fare, but if you're looking for a true trail bike the Spark could take some tweaking. There were also some accessories, such as the shock-mount chip, that seemed curious. A reversable chip in the linkage adjusts the bottom bracket by 7 millimeters and changes head angle by a half-degree. Getting two bikes for your buck might appeal to some, but for those who like a consistent feel the chip might be superfluous. There were also mixed feelings about the Twin-Loc remote lockout, which cluttered the handlebar and either reduced travel to 85 millimeters or locked both front and rear shocks at the same time. Good if you're trying to save braincells on course, but restricting if you prefer to tweak your suspension independently. Also, the Twin-Loc lever leaves no space for dropper-post hardware. We had questions about the new bikes before we even got our test rigs, so we sent out a few queries—the kind of things we thought you might be asking yourself when you're looking at this bike. Then we sent out another round of asks if any major questions or issues came up during testing. 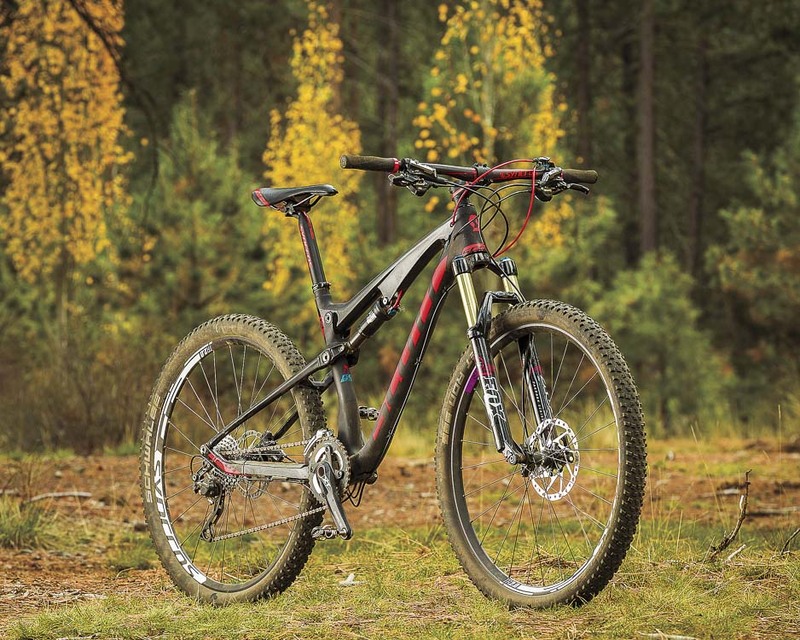 Here's the feedback we received from Scott's U.S. bike marketing manager, Zack Vestal. Consider this a bonus feature—just a little something extra to chew on if you're still hungry for information after you've watched our video reviews and flipped through the Bible of Bike Tests. VERNON FELTON: So, the Spark Contessa model is running the identical frame as the men's Spark (same geo, at least). Am I correct in stating that the things that make it "women's specific" are the cockpit components? ZACK VESTAL: You are mostly correct. The Contessa models get a shorter stem, narrower bar, wider saddle, smaller-diameter grips. But it's also worth noting, however, that the shock tune on the Contesssa is adjusted for lighter-weight riders. VF: Some people would argue that a women's-specific bike should incorporate an entirely different frame (for a given model) than the male version. Other folks argue that the frames should be the same and that it’s the component choice that matters. It would appear that Scott is in the latter group. If I've characterized that correctly, what's Scott's official reasoning/position on how to best make a women's-specific bike? ZV: Yes, if you want to characterize Scott Sport's approach in such a way, then yes, for the mountain bikes we've taken the latter approach. On the road side, where you could make a case that precise fit is a more sensitive topic (see also: NAHBS, custom built bikes, etc), we've got the Solace model that's made in five women's-specific sizes, with adjusted geometry. The top tubes are 10 millimeters shorter and the head tubes are 10 millimeters longer, and the tube wall thickness and diameters are also adjusted based on the frame size. On the mountain bike side, in general, for both men and women, the frames are made in fewer size increments (S, M, L, XL) and very commonly rely on components (stem, bar, seatpost) for fine-tuning fit. Whereas on the road side, you've got 48cm, 50cm, 52cm, 54cm, 56cm, 58cm, 61cm…. much more closely-spaced frame sizes are the norm, and our designers find it more fitting to integrate a specific geometry set with sizes adjusted for female riders. Basically the feeling is that it's quite common and generally easier on a mountain bike to make fit adjustments via components, both for men and for women, and it's an approach that works well. VF: No Spark Contessa 29er models? Just curious….why? ZV: Yes. That's a good question. It speaks mainly to my earlier point. Broadly speaking, our feeling is that the 27.5-inch wheelsize is an awesome place to be, with nearly all the benefits of 29er and none of the weight gain, inertia, etc. So, especially for a set of riders that, broadly speaking, tend to be smaller in body size, scaling the wheel size accordingly makes a lot of sense. Our "Wheel Size Matters" campaign from early 2014 was aimed at encouraging riders to think in terms of scaling their wheel size with their bike size, and also with their riding preference, of course. Scott is all about keeping bikes as light as possible, and especially for smaller riders where bike weight is a larger percentage of bike-and-body combined weight, it makes sense to offer the 27.5 wheel size as the preferred choice. I mean, for a 120-pound female rider, that 24 pound bike is a lot—it represents 20 percent of the bike and body combined weight. Whereas for a larger guy, say someone who's 200 pounds, that 24-pound bike is only 12 percent of their combined weight. Speaking generally, it's easier for a bigger person to control a bigger bike, and a lighter rider is disproportionately "penalized" while riding a heavier bike. Bottom line: keeping the bikes light for the small riders really makes a huge difference in their experience out on the trail.